The new 2016 Toyota Hilux, unveiled at the 2016 Geneva motor show, is the latest link in the chain of exceptional Hilux models dating back to 1968. It offers an even tougher chassis, enhanced 4×4 capability, practicality and functionality, better safety features and an even more appealing cost of ownership – not to mention the new styling and improved comfort. Here’s our rundown of exactly what’s changed for the new Hilux compared with the outgoing model. The new 2016 Toyota Hilux will be available with a new 2.4-litre D-4D diesel engine, in two- or four-wheel drive variants and with either an uprated 6-speed manual transmission or a new 6-speed automatic. The new engine has vastly improved torque delivery in the low and medium speed ranges, as well as class-leading fuel economy. As well as having a lower environmental impact, the engine is also far more responsive than before. One change for the 2016 Hilux is the removal of the low-range four-wheel drive gear lever, which has been replaced by a switch. This is easier to operate and improves the system’s durability and reliability – and only makes it possible to engage low-range gears when it is safe to do so. See the key engine specs at the bottom of the page. 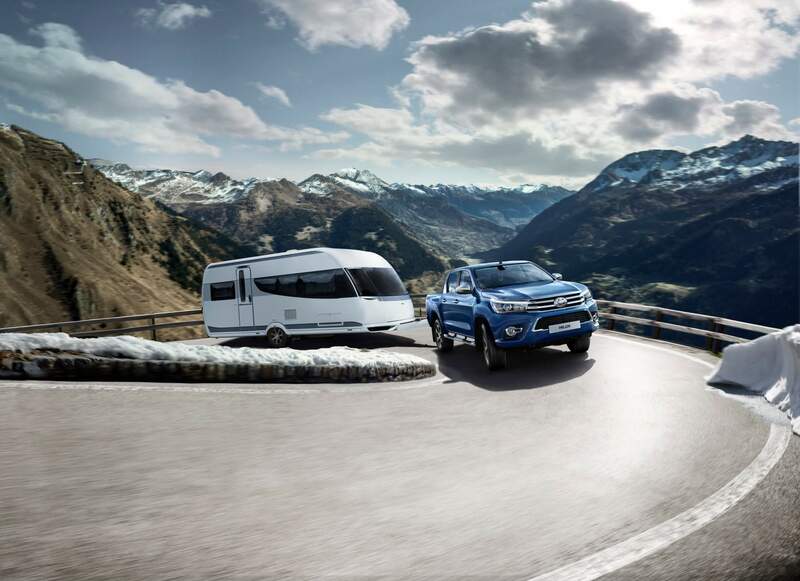 Compared with the current Hilux, the torsional rigidity of the new model’s chassis has increased by 20 per cent – making it even more stable and strong. New suspension has furthered off-road capability as well as producing improved SUV-like ride comfort. The new 2016 Toyota Hilux is longer and wider than the outgoing model, with a lower overall height. The wheelbase remains the same. 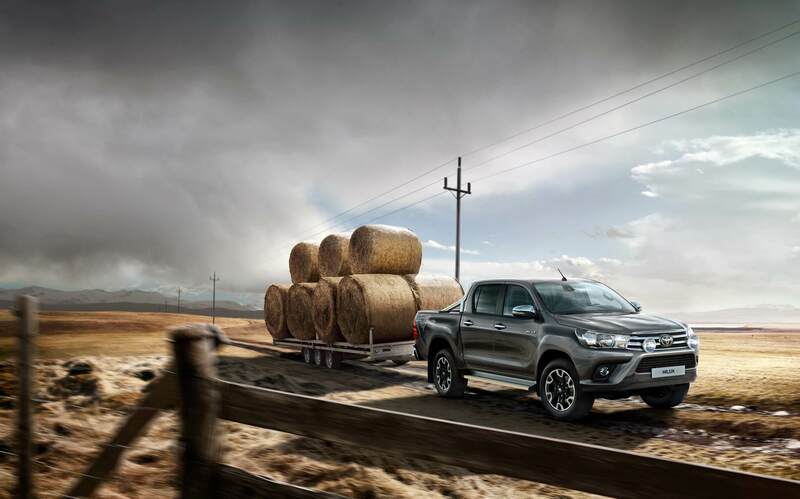 The maximum towing capacity of the new Hilux is 3.5 tons*. *subject to UK homologation, may be listed as 3.2 tons in other markets. The rear deck has a class-leading maximum width of 1,645mm (124mm more than before), and it’s stronger – with redesigned floor ribs and a reinforced header panel. The tailgate now features stronger link-type tailgate hinges and heavy duty steel plate brackets, to keep your kit super-secure. Measurements and specifications may vary, depending on cab type. Hilux now has Toyota’s ‘Keen Look’ styling on the headlamps and upper grille. The bumper has a more expressive shape and a larger lower grille, while the placement of the fog lights and wrap-around headlamps emphasise its width. At the side, the wheel arches are more pronounced, yet seamlessly integrated into the body shell. A new styling line links the front and rear wheels before curving upwards to anchor the wrap-around rear lamp clusters. The B-pillar is also blacked out within the smooth, rear-slanted silhouette of the cabin, while a new chrome belt-line links the cab and rear deck. There will also be a choice of new 17- and 18-inch alloy wheels. Viewed from the rear, the Hilux shows off new lamp clusters, a bumper set lower to the ground and with a lower step for improved access. The rear view handle is now integrated into the handle assembly. The roof aerial has been repositioned from the rear to the front, and the roof itself now has V-shape contours to channel air to the sides of the vehicle, rather than toward the deck or tailgate, where it can create drag. Inside, new Hilux has more equipment and better quality materials. The new features available on Hilux (depending on model trim level and specification) include a new tablet-like 7-inch touch screen multimedia system (see below); a new driver’s instrument binnacle with a full 4.2-inch TFT information display; a new steering wheel with integrated switchgear; a shortened gear lever; a six-speaker audio system; and a new air-conditioning system with new air vents. Soft-touch materials are now in place on elements like the armrests, while the metallic-coated styling elements create a more cohesive look. All of the interior lighting is now blue, adding to the harmonious feel. Leather upholstery is only available on top-spec models, while mid grade versions get high-quality fabric. Entry grade models are available with a tough, hard-wearing material ideal for business users. The Hilux can carry plenty on its flat-bed, but there’s lots of storage spaces inside the cabin too. It has a split-level glove box – the lower section is lockable, while the upper part is connected to the air-con and can act as a cool box for two 500ml bottles. Other storage includes: a centre console box equipped with a 220V power socket; an overhead sunglass holder; dashboard-mounted cup holders; a large cup holder and storage tray between the drivers and front passenger, which has two 12 V sockets and AUX and USB ports; a rear armrest with twin cupholders; pockets and convenience to the front seat backs; rear ceiling hooks; and under-seat storage compartments in the rear. The new Hilux is equipped with Toyota Touch 2 audio, or Touch 2 with Go navigation, depending on grade. The touch screen is now measures 7 inches corner-to-corner, up from 6.1 inches in the outgoing model. All controls have been integrated into the capacitive touchscreen, which is now a completely flat panel. The screen is easier to use than before, as well as more readable. Where is the Toyota Hilux made? The 2016 Hilux models that arrive in the UK and western Europe will be produced in South Africa at Toyota South Africa Motors. The 2.4 D-4D engines are made in Japan and the gearboxes are made in Thailand, Philliphines and India (manuals) or Japan (automatics). Globally, Hilux will be made in six locations: Thailand, Argentina, Malaysia, Venezuela, Pakistan and South Africa. The car was designed in Japan and its chief engineer is Hiroki Nakajima.